Kanazawa has a superb collection of first-rate sights. My carefully planned one-day and two-day itineraries allow you to make the best use of your time. I also provide a super Tokyo-Kanazawa-Kyoto itinerary. I’ve spent a lot of time in Kanazawa and worked closely with my local sources to construct the ideal itineraries to maximize your precious time in the city. Choose the best one below to suit your schedule. For information on the sights mention here, see my Things to Do in Kanazawa page. For transport information, see my Getting Around Kanazawa page. For restaurant suggestions, see my Places to Eat in Kanazawa page. For my hotel suggestions, see my Kanazawa Hotels page. One day is enough time to see the main sights in Kanazawa. You have to spend a night in Kanazawa to do this (either before or after doing this itinerary). Trying to do this as a daytrip from somewhere else (like Kyoto or Osaka) would just result in a rushed and tiring day. For some suggested hotels, see my Kanazawa Hotels page. Note that I describe this as a walking itinerary, but you can rent a bicycle or take buses or taxis as you wish. Note that this itinerary is designed to avoid the crowds, so you start at the most popular places early in the day. Start at Kanazawa Station. There is an excellent tourist information counter on the ground floor of the station with English speakers available. There’s also a dedicated transport information counter just outside the south (main) exit of the station. Take a bus or taxi to Kenroku-en Garden. I like to visit early in the day here to avoid the crowds. I suggest starting at the Katsurazaka Gate, which is at the northeast corner of the park, close to the Kenrokuen-shita bus stop. There’s an information booth near this entrance that has maps of the park. Take a nice leisurely stroll through the garden, which should be uncrowded in the morning (the garden opens at 8am in winter and 7am in summer). Spend an hour or so in garden. Exit via the Mayumizaka Gate. The 21st Century Museum of Contemporary Art is the premier museum in Kanazawa. This museum is usually packed, so try to arrive close to the 10am opening time. Note that it is closed on Mondays. Take your time exploring the museum and exit just as the crowds start to increase. If you’re hungry, there are plenty of restaurants. However, I recommend holding out until a bit later for lunch so you can eat at Omichi Market, which has some great restaurants. Exit the museum and walk north to Kanazawa Castle Park. I suggest entering via the Gyokusen’in Maru Entrance, which is on the southwest side of the park. This leads up to the lovely Gyokusen’in Maru Garden. Small paths lead up from here to the castle remains. Walk north through these and exit the park via the Ote-mon Entrance. Walk north from the Ote-mon Entrance of Kanazawa Castle Park for two blocks to the main street, Hyakumangoku-dori Street. Take a right here and walk for a few minutes to Omicho Market. Explore this excellent market for about half an hour. This should work up your appetite and allow the lunchtime crowds to disperse. If you can hold out until 1:30pm, the restaurants in and around Omicho Market will clear out a little. See my Places to Eat in Kanazawa for my restaurant picks in this area. After lunch, walk for 10 or 15 minutes west along Hyakumangoku-dori Street and take a left down the hill when you see the river (the Asano-gawa River). Cross the Asano-gawa River and enter the Higashi Chaya Area. Explore this area for a while and consider a nice cup of green tea and a sweet in one of the local teahouses. Cross back over the Asano-gawa and take a left into the quieter Kazuemachi Chaya Area. You can walk from the Higashi Chaya Area to Kanazawa Station in about 30 minutes, but consider a bus or taxi if you’re tired. Two days is the ideal amount of time to spend in Kanazawa. It allows you to slow down a bit and savor the things you’re seeing. Walk (30min), take a bus (20min) or a taxi (10min) to the Higashi Chaya Area. Explore this area for a while and consider a nice cup of green tea and a sweet in one of the local teahouses. Cross back over the Asano-gawa and take a left into the quieter Kazuemachi Chaya Area. Walk to Hyakumangoku-dori Street (just up the hill from Kazuemachi). Walk south to the second traffic light and take a left. Walk to the second traffic light and you will see the Ote-mon Entrance to Kanazawa Castle Park on your left. Enter the park and explore for about an hour. Walk out of the Ote-mon Entrance of the park (the way you came in) and walk two lights north to Hyakumangoku-dori Street. Take a left and walk for about 10 minutes to Omicho Market. Wait until the lunch rush dies down a bit and then eat at a restaurant in or near the Omicho Market. See my Places to Eat in Kanazawa for my restaurant picks in this area. If everything is too crowded here, continue to Korinbo (see following) and eat there. Walk south for around 20 minutes along Hyakumangoku-dori Street to reach the Korinbo District. There’s not much too see here other than shops. There are several cafes here where you can get a cup of coffee to power you through the afternoon. Walk just east from the Korinbo District (downhill from the 109 Building) and follow the canal north (right) through the Nagamachi Samurai Area. Continue all the way to the first traffic light, then go left. At the next canal, turn south (left again) and explore the rest of this area. Poke into some of the restored houses and shops along the way. Return to the main street (Hyakumangoku-dori Street) and either walk, or take a bus or taxi back to Kanazawa Station. Take a bus or taxi to Kenroku-en Garden. I suggest starting at the Katsurazaka Gate, which is at the northeast corner of the park, close to the Kenrokuen-shita bus stop. There’s an information booth near this entrance that has maps of the park. Take a nice leisurely stroll through the garden, which should be uncrowded in the morning (the garden opens at 8am in winter and 7am in summer). Spend an hour or so in garden. Exit via the Mayumizaka Gate. And walk across the street to the 21st Century Museum of Contemporary Art. The 21st Century Museum of Contemporary Art is usually packed, so try to arrive close to the 10am opening time. Note that it is closed on Mondays. Take your time exploring the museum and exit just as the crowds start to increase. Eat lunch near the 21st Century Museum of Contemporary Art. There are many good places in the district just west of the museum. See my Places to Eat in Kanazawa page for some recommendations. After lunch, walk south to the superb D.T. Suzuki Museum (and don’t forget to check out the garden behind the reflecting pool garden). Spend at least an hour here soaking up the calm beauty of the place. If you’ve still got energy, head north the way you came and make your way to the Kanazawa Prefectural Museum of Art. There is a back way here from the D.T. Suzuki Museum (it’s a bit tricky to find and you might have to ask someone to point the way). If you want an easier way, just return the way you came to the 21st Century Museum of Contemporary Art and then cross the street and go up Hirosaka and take a right to the museum. There’s a great café in the museum lobby where you can fuel up with coffee and cake. It’s a bit of a hike back to Kanazawa Station from the Prefectural Museum of Art, so I suggest a bus or taxi. 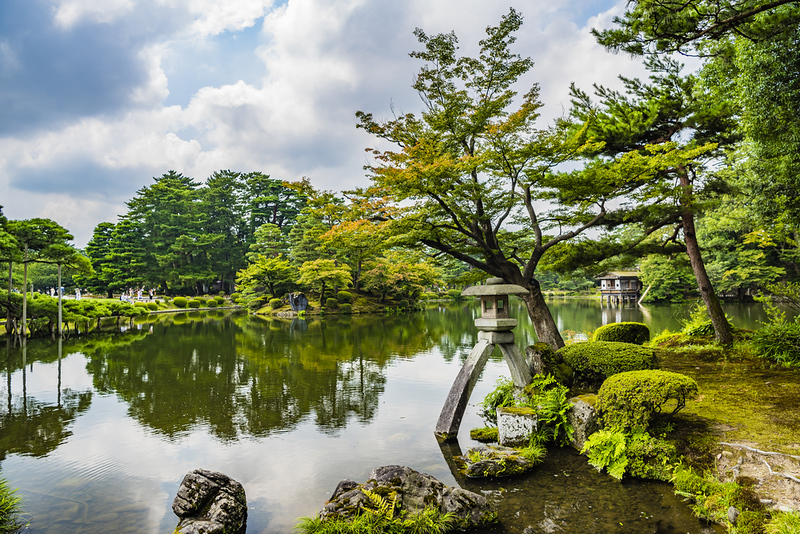 Kanazawa makes the perfect addition to the popular Tokyo-Kyoto itinerary. Here is the best way to do combine these three incredible cities into a good 10-day itinerary (note that you can do this in as little as 1 week if you wish). Start your journey with two or three days in Tokyo. For some suggested itineraries, see my Truly Tokyo Itineraries page. Take an early shinkansen from Tokyo to Kanazawa. See my Getting to Kanazawa page for details on the journey. Once in Kanazawa, do an abbreviated version of Day 1 of my Two-Day Kanazawa Itinerary (above). Consider omitting the Korinbo and Nagamachi portions of the afternoon section of the itinerary. Spend the night in a Kanazawa Hotel. See my Kanazawa Hotels page for some recommendations. Do Day 2 of my Two-Day Kanazawa Itinerary (above). Consider ending the day at the D.T. Suzuki Museum and omitting the Kanazawa Prefectural Museum of Art. Try to get back to Kanazawa Station around 3pm. Take a Thunderbird Express Train directly to Kyoto. You’ll arrive around dinnertime. See my Getting to Kanazawa page for transport details. Explore Kyoto. See my Inside Kyoto Itineraries page for some suggested itineraries. Return to Tokyo. See my Truly Tokyo How to Travel from Tokyo to Kyoto page for details. To fully plan your trip to Japan, see my comprehensive Japan itineraries which guide you to the best locations and map out each day for you.